Planet IRM (Infrastructure Relationship Management) is a visual, consolidated database repository of an organization’s IT/Telecom infrastructure, its interconnectivity and associated dependencies. The centralization of this typically disparate data allows businesses to Visualize, Analyze, Manage, and Maintain their entire IT and telecom infrastructure from anywhere within their network. Planet Inside Plant maintains all telecommunications infrastructure, cabling, equipment and connectivity information. It is an open system, supporting ODBC compliant databases like Microsoft SQL Server, Oracle, and Sybase. Planet Outside Plant provides the ability to manage outside plant infrastructure for campus environments and features Visual Pathway and Location Management. Planet WAN allows users to maintain a full inventory of WAN circuits, channels, users, cost centers, and service providers. Planet Data Center provides a single, centralized software application to manage data centers, including cable connectivity, power, heat, and space requirements. Planet MAC (Moves, Adds, Changes), included with every module, allows users to provision changes, generate work orders, and maintain a full audit trail. 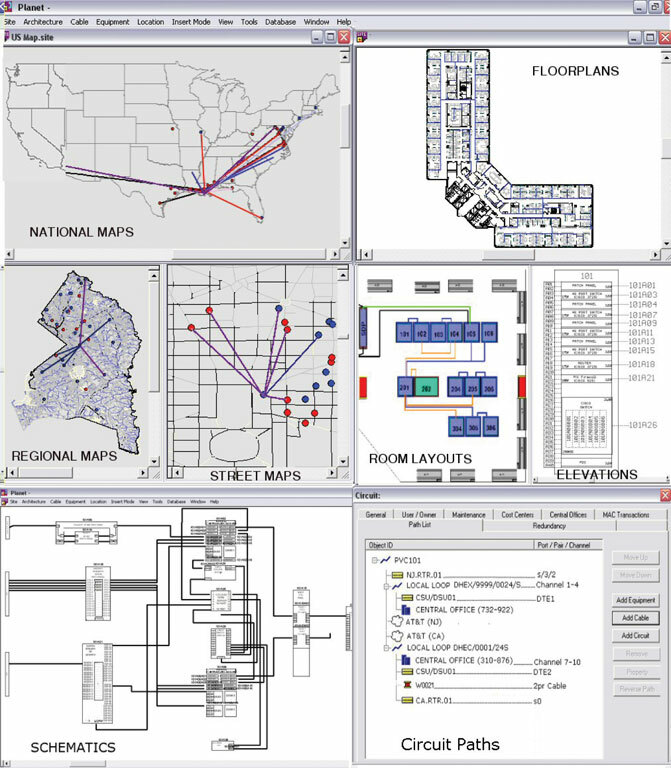 iiPDF and Planet eVolution provide web access to multi-layered, up-to-date critical infrastructure data in a unique and simplified intelligent PDF format for widespread distribution. Converter, the file conversion tool which provides conversion capabilities between Planet IRM and most of the popular computer-aided design (CAD) formats, now has the ability to convert ESRI SHP and GeoTIFF files as well. Converter can be used for creating Planet IRM sites from existing DXF, DWG, DGN, SHP, and GeoTIFF files, thus maximizing reuse of current existing infrastructure data content and greatly minimizing the time necessary for the initial population of data into the Planet IRM system. After Planet IRM is launched and in operation, a user can preview, customize and export drawings in DXF, DWG or DGN format for use with other software packages. Converter imports and exports layer information and provides layer management functionality to retain maximum data flexibility after conversion, allowing specific layers within a drawing file to be inserted into various CAD formats.